To see a photo of the aura, please click here. The aura consist of seven levels/layers/auric bodies . Each one of the subtle bodies that exist around the physical body, has its own unique frequency. They are interrelated, and affect one another and the person's feelings, emotions, thinking, behavior, and health as well. Therefore a state of imbalance in one of the bodies leads to a state of imbalance in the others. Learn How to See Auras. Pink-bright and light: Loving, tender, sensitive, sensual, artistic, affection, purity, compassion; new or revieved romantic relationship. Can indicate clairaudience. BLU AURA COLOR MEANING: Relates to the throat, thyroid. Cool, calm, and collected. Caring, loving, love to help others, sensitive, intuitive. INDIGO AURA COLOR MEANING: Relates to the third eye, visual and pituitary gland. Intuitive, sensitive, deep feeling. VIOLET AURA COLOR MEANING: Relates to crown, pineal gland and nervous system. The most sensitive and wisest of colors. This is the intuitive color in the aura, and reveals psychic power of attunement with self. Intuitive, visionary, futuristic, idealistic, artistic, magical. LAVENDER AURA COLOR MEANING: Imagination, visionary, daydreamer, etheric. SILVER AURA COLOR MEANING: This is the color of abundance, both spiritual and physical. Lots of bright silver can reflect to plenty of money, and/or awakening of the cosmic mind. GOLD AURA COLOR MEANING: The color of enlightenment and divine protection. When seen within the aura, it says that the person is being guided by their highest good. It is divine guidance. Protection, wisdom, inner knowledge, spiritual mind, intuitive thinker. WHITE AURA COLOR MEANING: Reflects other energy. A pure state of light. Often represents a new, not yet designated energy in the aura. Spiritual, etheric and non-physical qualities, transcendent, higher dimensions. Purity and truth; angelic qualities. See one example of a yellow/green aura. 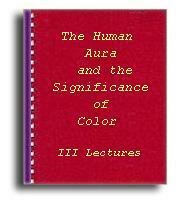 Learn more about color healing and about the human aura and the significance of color. Just click at any of the images below.